Roxy’s Best Of… Bay Head, New Jersey » Blog Archive » Jersey Shore Artists: Wendy McCarthy… Mermoments Is More Than Just A Trilogy! 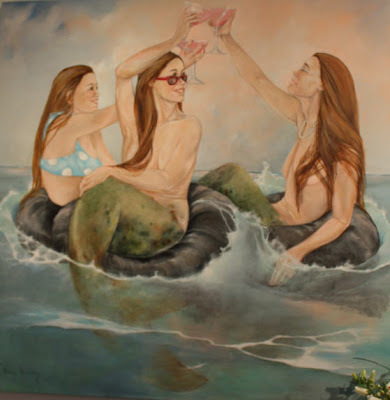 As I posted earlier in the week, our lovely Mermaid Swim Team has been on vacation, back at the Anchor & Palette Gallery on Mount Street in Bay Head, NJ, for local Wall, NJ, artist Wendy McCarthy’s Mermoments show. Tonight, Rex, Maddie, London and I attended the opening reception and learned that Mermoments is much more than a trilogy….the ambitious artist painted three more in the series for this week’s show, and has a total of twelve in the works for a Mermonths calendar! I snapped a photo of the amazing Mermaid Cocktail Party (above). Wendy uses her entire family as mermodels…that’s her daughter with the polka dot bikini! While we don’t have a space in either of our homes that is grand enough to hang the original painting, I know that our family will have to own a giclee (print). The Mermaid Swim Team for the girls, the Mermaid Cocktail Party for the Roxiticus Desperate Housewives! Mermoments opened with tonight’s reception at the Anchor & Palette and runs through August 4th on Mount Street in Bay Head, NJ.